In this June 28, 2018, file photo, smoke looms near La Veta Pass in Costillo County in southern Colorado, from one of several wildfires burning in Colorado and Utah. Authorities say some structures have been burned by what is called the Spring Fire. Jesper Joergensen, 52, has been arrested on charges of arson in connection with the Spring Fire in southern Colorado. The arrest was announced Saturday during a community meeting. According to a Costilla County Sheriff at the meeting, Jorgensen was arrested on the same day as the fire but law enforcement had not confirmed that an arrest had been made until now. The investigation was led by the Costilla County Sheriff's office with the assistance of the Colorado Bureau of Investigation, State arson investigators, Colorado State Patrol officers, and Immigration and Customs agents. It is unclear why immigration officers are involved in the case, but the investigation is ongoing. As of Thursday the fire had grown to 6 square miles and had destroyed some structures, but fire managers aren't sure how many. 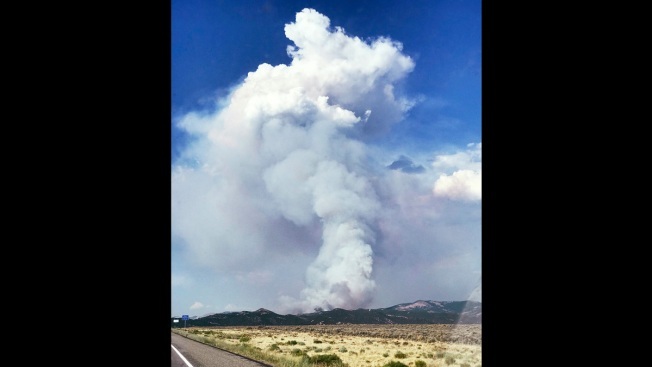 The fire is east of Fort Garland, about 160 miles (257 kilometers) south of Denver. Firefighters hadn't established any containment lines as of Thursday. Residents of about 350 homes were ordered to evacuate. Others have been told to prepare to leave, but officials were uncertain of the number. The evacuated homes are in Forbes Park, a housing development started by multimillionaire Malcolm Forbes in the 1970s. Roads manager Wade Colvin says residences range from large homes to cabins. He says about 300 people were there when the fire was reported Wednesday. Hot, dry and windy weather has raised the fire danger across much of Colorado as well as Utah and parts of Arizona and Nevada.